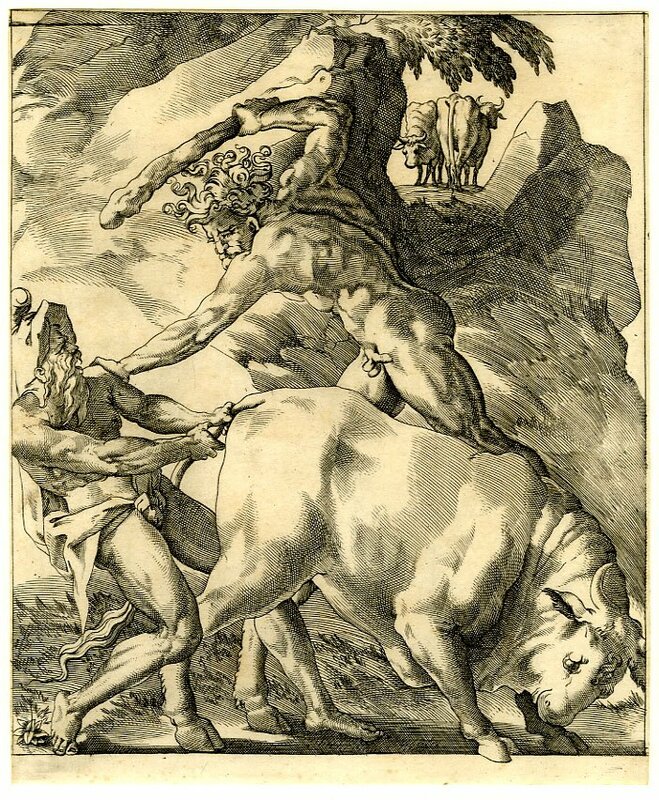 Etching by Antonio Fantuzzi, 27.6 x 21.9 L (London). Bartsch, XVI, 1818, 399, 59, as Anonymous, School of Fontainebleau, after Rosso. 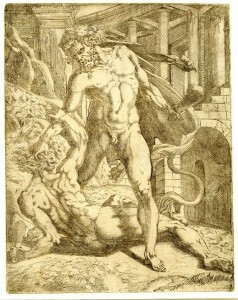 Zerner, 1969, A.F.67 (Paris), probably 1543, after Rosso. COLLECTIONS: Florence. London, 1850-5-27-93. New York, 1987.1134. Paris, Ba 12, folio 31, in red ink. Kusenberg, 1931, 167, as Anonymous, after Rosso. Zerner, in EdF, 1972, 271, no. 322, as Fantuzzi after Rosso. Zerner, IB, 33, 1979, 334 (Paris). Davis, 1988, 195, under no. 82, Fig. (London), as after Rosso. Boorsch, in French Renaissance, 1994, 245-246, no. 43, Fig. and Color Pl. 7 (Paris, Ba 12, vol. 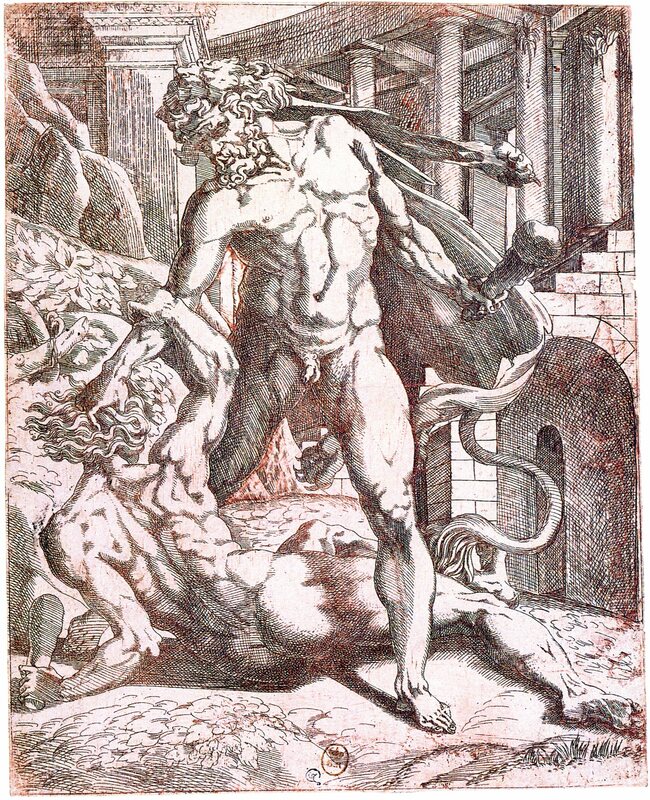 1, in red ink), as Fantuzzi, as showing Hercules and Cacus(? ), and as no doubt after Rosso, the setting similar to the background of Primaticcio’s Holy Family in the Hermitage, and of the Holy Family drawing in Berlin (no. 22478), but noting also the background in Giulio Romano’s works, his altarpiece in S. Maria dell’Anima, Rome, and his Virgin and Child in Baltimore. Carroll, 1995, 303, as not after Rosso, but rather more like Giulio Romano. Béguin, 1995, 193, may be referring to the background of this print with reference to the background of Primaticcio’s Scene of Fire in Ensba, Paris (Brugerolles and Guillet, 1994, 46-49, no. 17, Fig.). 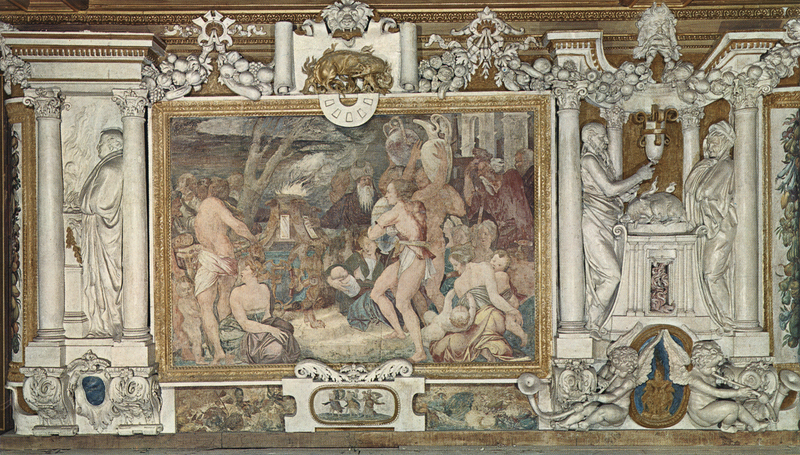 The figures in this scene have a thickness of proportion, and Hercules a brutish appearance, that are not identifiable with Rosso’s more graceful art. 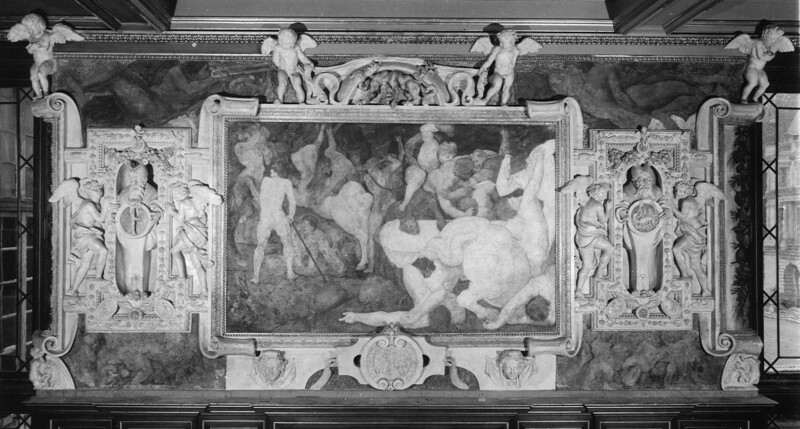 One might expect in such an image some relation to Rosso’s ornamental and witty Hercules episodes engraved by Caraglio in Rome (Fig.E.24), or some correspondences with a few of the frescoes in the Gallery of Francis I, such as the Combat of Centaurs and Lapiths (Fig.P.22, I S a) or the Scene of Sacrifice (Fig.P.22, VII N a), but there are none. 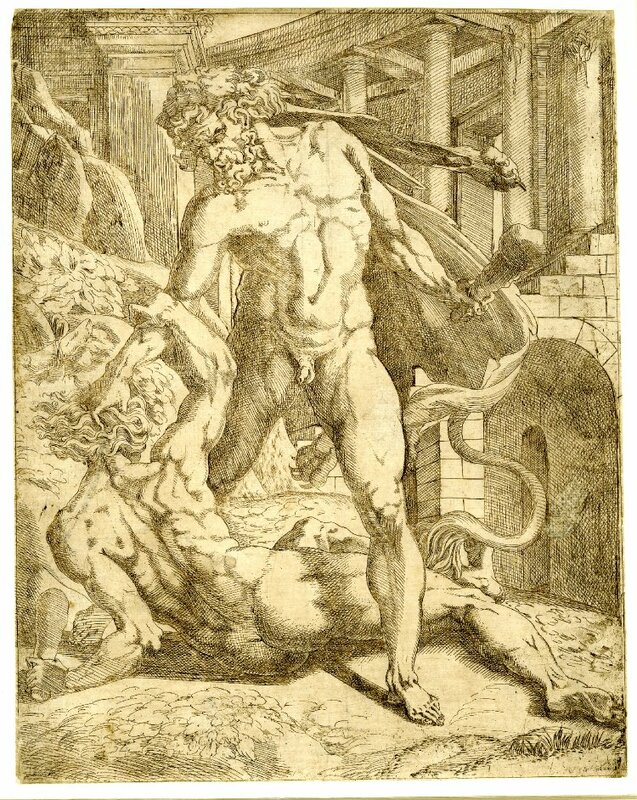 I have thought of a possible association with Bandinelli or, more likely, Salviati, but also with Giulio Romano, to whom the background can be related. That background architecture is also related to that in the background of Primaticcio’s Holy Family in the Hermitage, but in reverse, which could have been gotten from the artist’s association with Giulio.